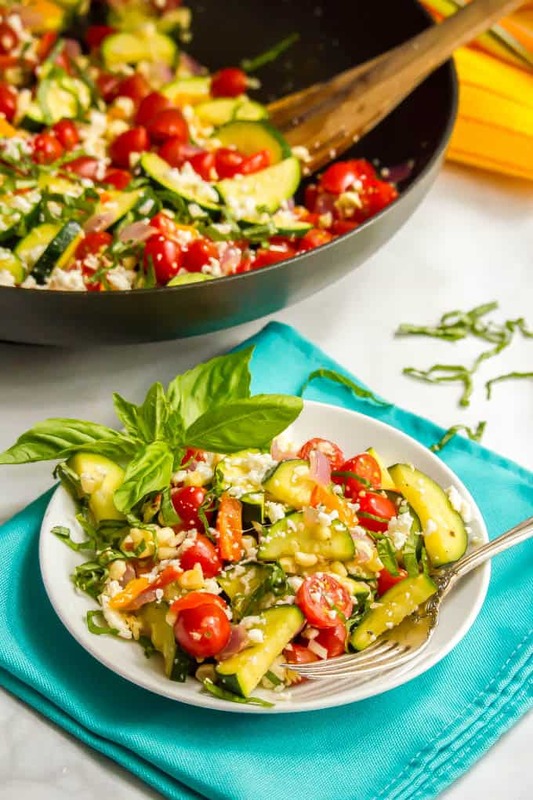 Summer veggie skillet is a colorful, delicious and healthful way to celebrate the bounty of fresh summer vegetables! 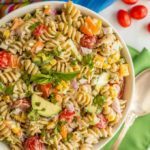 This easy one-pan recipe has zucchini, peppers, tomatoes and corn and is finished with fresh herbs and cheese for a yummy side dish! Thank you Cacique® for sponsoring this post. 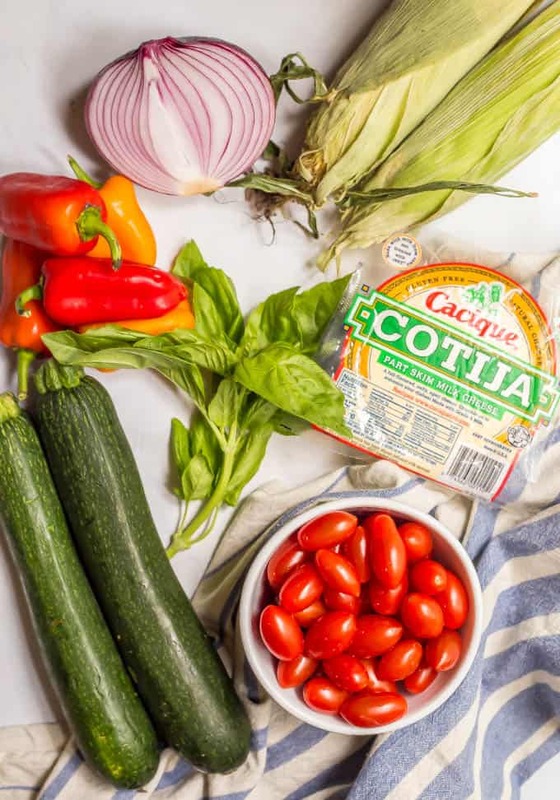 Visit your local grocery store to pick up your fave Cacique® product for a delicious dinner tonight! Today’s summer veggie skillet is ALL about the bounty of summer veggies that we are so fortunate to be surrounded by right now. I can’t tell you how happy it makes my veggie-loving heart! 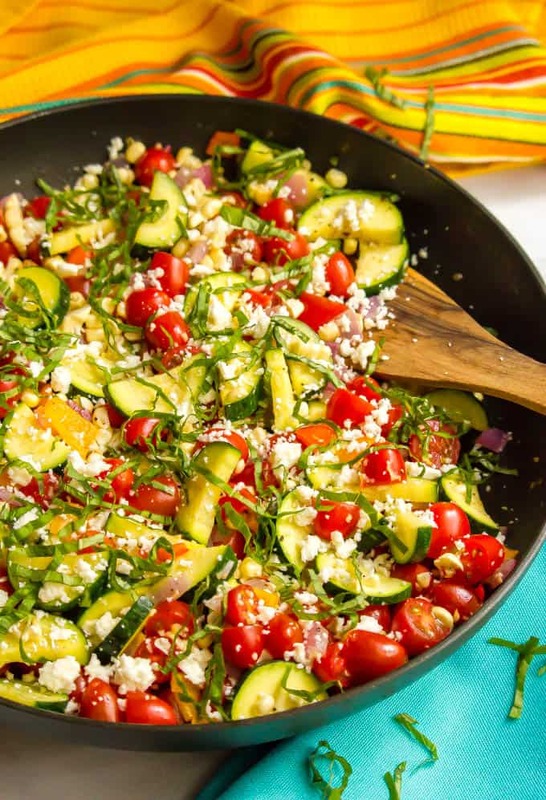 And this colorful skillet is the perfect way to celebrate those gorgeous vegetables, whether they come from your garden, farmer’s market or local store. It’s also perfect for busy nights when you don’t want to slave away in the kitchen. Just keep throwing veggies into the pan, add your herbs and cheese at the end and you’re done. I’m also so happy to be partnering with Cacique® and their delicious line of Hispanic cheeses, chorizos and cremas. Cacique® products inspire you to create and share quick Mexican recipes that make it easy to savor the tastes and flavors of Mexican food without spending a long time in the kitchen. I’ve always got their Cotija cheese or crumbled quest fresco in the fridge and I’ve recently gotten into their cremas, which are perfect for drizzling over tacos, rice bowls, fajitas and more. 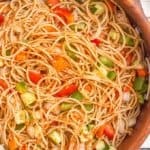 I love how simple ingredients like this can take a dish from pretty good to over-the-top! 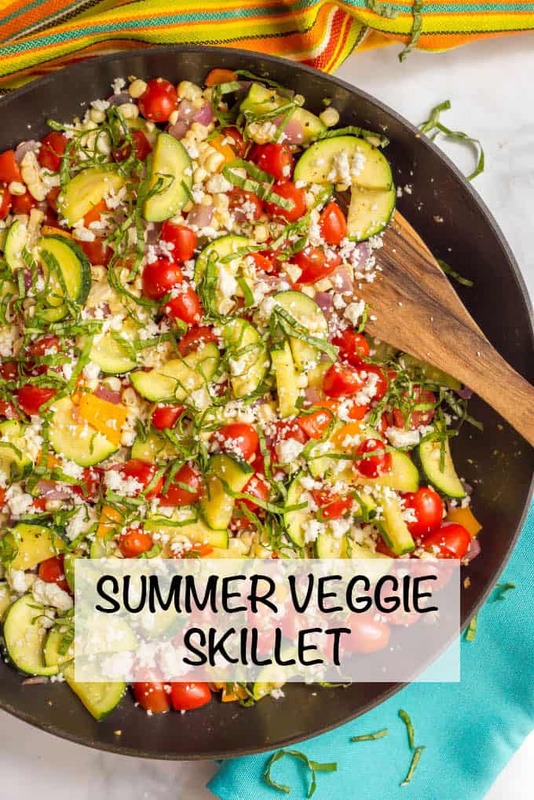 This summer veggie skillet is perfect to make when you are grilling out and want a healthy, delicious side dish. 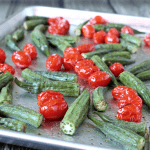 You could even put your pan on the grill to cook these veggies alongside your chicken, fish or pork. 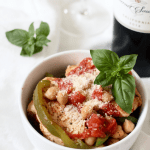 You could also add in some cooked, shredded chicken or cooked, sliced sausage or some cooked beans to make this a complete meal. I used a red onion here but a regular sweet onion would work as well. I always have cherry tomatoes on hand during the summer, but you could substitute fresh chopped ripe tomatoes or heirloom tomatoes here. You need about 1 1/2 cups total. I use fresh summer corn but you could substitute frozen corn (thawed) or a can of corn (drained) instead. Feel free to add a few handfuls of fresh baby spinach here too if you love it as much as I do. I like the basil on top of this but you could use parsley or cilantro if you prefer. Similarly, I love Cotija cheese with this, but you could substitute crumbled queso fresco feta cheese or even grated Parmesan cheese. Feel free to serve this with some sliced avocado if you’re a fan. I hope you enjoy all the fresh flavors of the season with this easy summer veggie skillet! 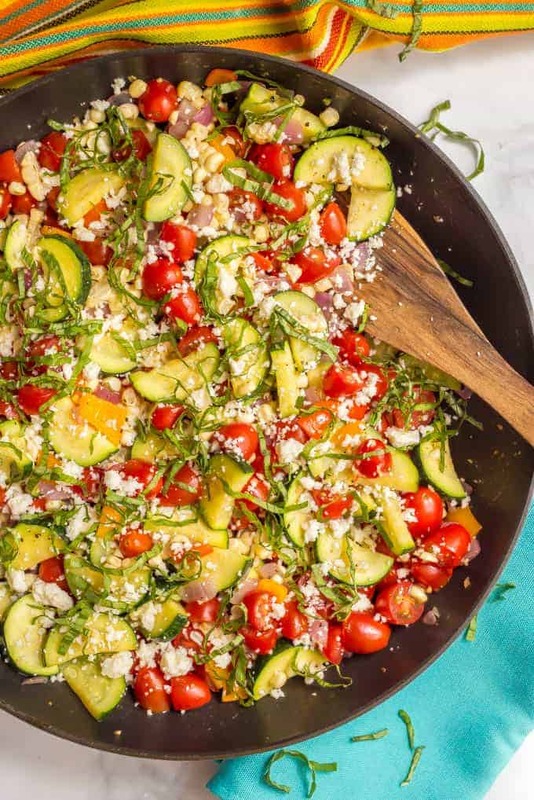 Summer veggie skillet is a colorful, delicious and healthful one-pan side dish with tons of fresh summer vegetables! Heat oil in a medium skillet over medium heat. Add onion, garlic, zucchini and bell pepper and sauté for 5-6 minutes, stirring occasionally, until softened. 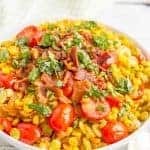 Add tomatoes and corn and stir to combine. Season everything with salt and pepper. Cook for 1-2 minutes, to warm through. Remove from heat, sprinkle with basil and cheese and serve immediately. 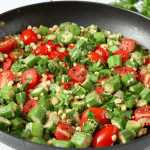 Oh wow – this veggie skillet is so healthy and full of so many delicious flavors! i love the sprinkle of Cotija cheese on top – yum! Thanks Holly! The Cotija really makes for such a great finishing touch! Thanks Erin! The cheese and fresh herbs really add great flavor at the end!